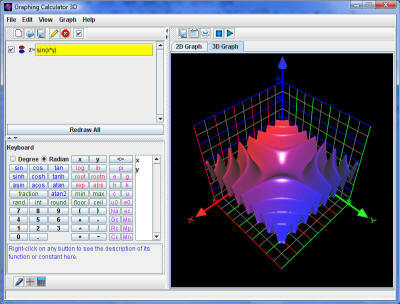 Graphing Calculator 3D is an easy-to-use tool that plots 2D and 3D functions and coordinates. Graphing equations has never been any easier. Simply type a function and press Enter. It instantly plots high quality 3D graphs. Graphs can be shaded with custom gradual colors along x, y or z axis. In 3D graphs, the lighting is enabled to demonstrate the depth of the surface through shades and shadows. Rotation and translation with mouse is fast. ...... Graphs can be shaded with custom gradual colors along x, y or z axis. In 3D graphs, the lighting is enabled to demonstrate the depth of the surface through shades and shadows. Rotation and translation with mouse is fast and responsive. Value table for x-y-z coordinates can be generated, modified and re-plotted. Function Graphing easily exports charts & data to your documents. Full featured free calculator with all basic features of a calculator and more. Qweas is providing links to Graphing Calculator 3D 2.3 as a courtesy, and makes no representations regarding Graphing Calculator 3D or any other applications or any information related thereto. Any questions, complaints or claims regarding this application Graphing Calculator 3D 2.3 must be directed to the appropriate software vendor. You may click the publisher link of Graphing Calculator 3D on the top of this page to get more details about the vendor.